People, especially outside the US, always ask ‘What makes America great?’ A popular answer is America’s private sector, with its capacity for innovation and entrepreneurship. A second answer is American universities, especially at the graduate level. Others will argue that it is its legal system that allows fast transactions and enforces contracts. I believe that all these factors contribute to America’s greatness and I’m very excited about the educational-industrial complex [EIC]. Namely, the transfer of knowledge and expertise between universities and companies that benefit from supporting legal frameworks and is behind much of the success of California, Massachusetts and other states in the biotechnology and information science sectors. I will present some of the main features of the EIC, and then present how it is manifested in different ways in Berkeley. Innovations are new ways to do things or new products and are frequently the result of research-based discoveries. The transformation to commercial products requires significant investment in upscaling, testing, development of industrial patents, production, and marketing. Many innovations are originated by practitioners in the private sector, but the university is very good at coming up with new research discoveries especially ones based on the advanced sciences of genetics, molecular biology, nanotechnology, electronics, etc. Most of the ideas don’t result in commercial products; and commercialization is very expensive and therefore private sector resources are needed to invest in it. People have frequently asked me why the state shouldn’t invest in developing new technologies. History and theory suggest that states are not very good at picking winners but have relative advantage in writing and enforcing rules. At the same time, the private sector is not good at self-regulating. In addition, tax revenues are limited and probably have better use in providing public goods and enhancing welfare. So, we reach a complementary arrangement where the state finances public goods research and establish regulations while the private sector commercializes and scales innovations. For private individuals to invest in development of innovations, they need some assurance that they will have exclusive benefits from it, which is why we have patents. One result is the establishment of university-based Offices of Technology Transfer [OTT] that sell the rights to a technology to the private sector. Since federal money supports much of university research, the Bayh-Dole Act of 1982, which gives universities the right to patents that originated with federal monies and the OTT is issuing patents, finding buyers to license university patents, and enforcing them and collecting revenues. Obviously, the performance of the OTT can always be improved, but they have played an important role in enhancing university-industry linkages and building American industry. OTT revenues are divided among researchers, departments, and the university. While OTTs revenue provide a very small fraction of university’s revenue (maybe less than 2%), it is a very important contributor to support research in certain fields. But, technology transfer through the OTT and other means, have been crucial for the development of many industries. While major corporations seem to be the natural potential buyer for university patents, in many cases that doesn’t happen. In some cases, it was because research divisions within companies felt that university innovations were competitors and that university innovations were not ‘invented here’. In other cases, university innovations resulted in the introduction of something new. Frequently, universities sold the rights to patents to startups, which frequently involved university professors, and these startups might have then further developed the technology. These startups were sometimes taken over by major companies or grew into major companies themselves. 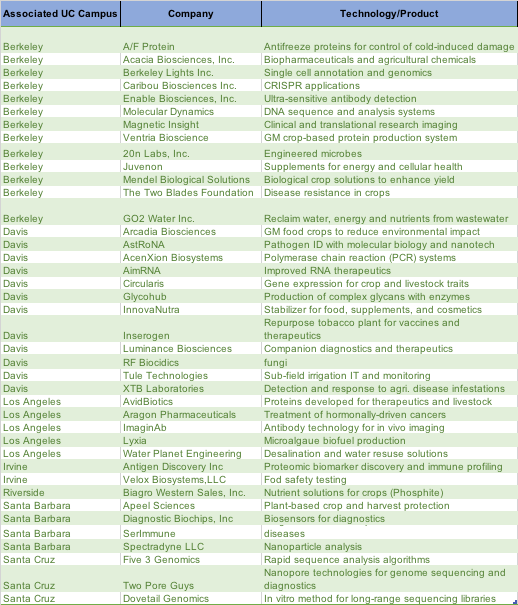 For example, major biotechnology companies in California, such as Genentech, Amgen and Chiron (now part of Novartis), started and were led, to a large extent, by scientists from UC and Stanford. Calgene and Agrocetus were agbiotechnology startups that were taken over by Monsanto. Technology transfer from university to industry has many channels, including educational and training, contracts by the university, publications, etc. Thus companies like Google, Apple, Intel, Qualcomm, etc. benefited immensely from the various mechanisms of transfer from the university. 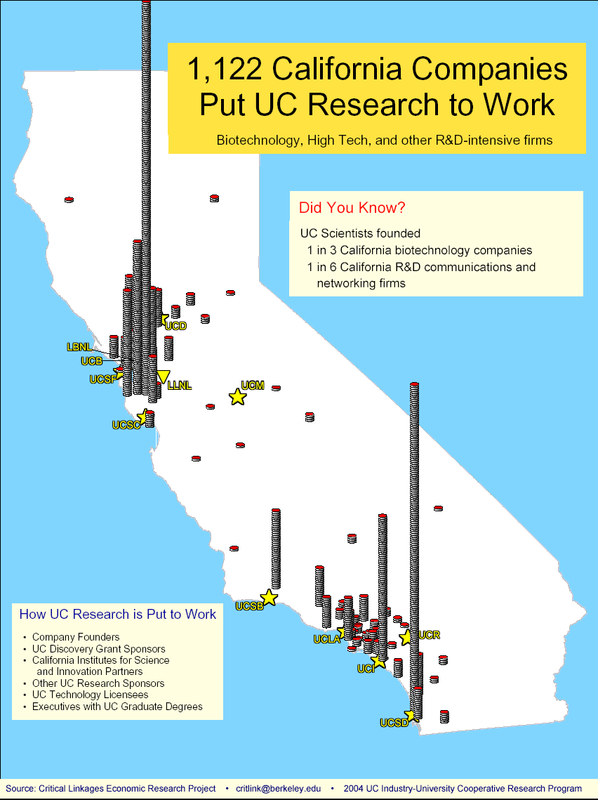 As you can see from Figure 1 in 2004, over 1000 companies relied on UC Research and Table 1 has a partial list of some of the companies that were originated in the university in the agricultural area. Much of the growth was supported by contracts, mostly from government, to conduct research that contributed to many priorities, including national security, sustainability, improved infrastructure and communication, etc. As I understand it, the University of California has a contract with the Federal government to manage the research at Lawrence Berkeley National Lab. Present and past contracts with the government to manage the national labs (like LBNL and Lawrence Livermore National Lab) have provided resources to support research that expanded human knowledge in physics, biology, information sciences, and chemistry, among others. Industry is becoming a growing source of support of university research. There has been quite a lot of concern that industry-funded academic research is less accessible and useful to others, but Brian Wright and his collaborators present data from the UCs showing that this is not the case. UC Berkeley has signed agreements with major companies. A pioneering effort was the agreement between the University and Novartis on pursuing frontiers in plant biology. More recently, about ten years ago, Berkeley was competing with other universities on a large contract with British Petroleum for research on biofuels and other areas of interest to the company. A coalition between Berkeley, the University of Illinois, and LBNL won the contract that led to the establishment of the Energy Biosciences Institute [EBI]. Despite the financial troubles of BP resulting from Deepwater Horizon, the extensive contract lasted for about 8 years and paid the EBI close to 400 million dollars. The contract with BP continues at much lower scale today. But the EBI continues and recently signed a 5-year contract with Shell Oil. The EBI is evolving and is now starting an incubator program for startups and education programs for entrepreneurship among students. I had the privilege to be a part of the EBI and found it to be an amazing arrangement. It had a steering committee comprised of university and BP representatives and an executive committee, which set rough priorities for research. University researchers were asked to provide research proposals in major areas of research that the EBI was interested in, but consistent with their own expertise. This is no different than research supported by the government, which identifies major areas of research and researchers submit proposals. Representatives of the companies were a part of the team that reviewed the proposals and most of them addressed basic research problems and issues. What I found amazing is that this was a real multidisciplinary endeavor, where I as an economist, could interact and collaborate with chemical engineers, biologist, etc, and I gained a lot from these interactions. The EBI allowed support for much of the social science research in areas of biotechnology, biofuel and in some cases identified some of the weaknesses of biofuels and was critical of many policies that were aimed at supporting it. At the same time that the EBI was started, Jennifer Doudna and her team came with the breakthrough that provided the capacity for gene editing. The excitement of this innovation led to the establishment of an institute called the Innovative Genomics Institute [IGI]. This institute is dedicated to research, taking advantage of new gene editing technologies and applications in medicine, agriculture and material sciences. It is centered in Berkeley but involves scientists from other campuses. Some of the funding for the IGI is from donors like the Moore Foundation, which is leveraged by matching contributions. It is also supported by funds from companies and government agencies. I am a minor part of the IGI, looking at the potential economic and environmental impact of some of its applications, especially in agriculture under alternative policies. The IGI research is addressing ethical challenges of gene editing both in medicine and agriculture and considering mechanisms and regulation that prevents abuse. What I find unique about this multidisciplinary effort is that we have a team that recognizes how the application of modern breakthroughs in the life sciences and other disciplines can be used to address issues of disease control, food security, climate change and other global issues, as well as how to apply these technologies safely. The EBI and the IGI are two examples of complementary institutions that I believe will be imitated elsewhere. The EBI serves as a bridge between university and industry. It looks to establish contractual arrangements with companies and other entities (including environmental NGOs) that can address many topics that require high quality, university knowledge that are of interest to our partners. We don’t expect companies to ask universities to solve immediate problems (even though it may happen), but rather to gain basic understanding of the sciences behind solving the challenges of the future. The IGI emphasizes one area and goes into new depths in pushing it forward. It is built on taking advantage of disruptive breakthroughs. Gene editing will change medicine, agriculture, chemistry and materials science, and will expand the capacity of the bioeconomy. The resources provided by both arrangements enhance university research capacity. It is not only in terms of dollars and cents, but university faculty get access to the knowledge and perspective of professionals in the field. I have been studying technology for years. In the beginning I was a skeptic of industry and university collaboration. But what I have come to realize is the incredible complementarity of the two. While university scientists have relative advantage of understanding new frontiers, industry people understand constraints and applications of the technology, and have the capacity to accelerate the upscaling and development of, say, a new plant variety or machinery, and can provide insight that can prevent leading to dead ends. Of course, society must be vigilant in making sure that university discoveries are not entirely captured by industry; but this constraint should not stifle cooperation. Most importantly, it is crucial that private sector support for university research continues and be enhanced. However, it won’t be enough. The story of technology transfer in the United States is that public research provides the base of key innovations, which leads to startups and changes in industry that are behind the creative destruction that keeps the economy competitive and fresh. An excellent background on the contract and the economic principle behind the contract design is in Rausser, Gordon, Holly Ameden, and Reid Stevens, eds. Structuring Public–Private Research Partnerships for Success: Empowering University Partners. Edward Elgar Publishing, 2016.